Earlier this month, the Disney California Adventure Food and Wine Festival 2017 kicked off at the Disneyland Resort, running daily until April 16th. Being Orlando based, all of my experience with such events has been at Epcot, so I was excited to see a festival in another Disney theme park for a change. The number of booths at this event isn’t as staggering as Epcot, but on a weekend, it can be just as busy, if not worse than a Saturday and Sunday in October during the Florida Food and Wine event. If you can, I suggest you visit on a weekday for the DCA event, as we had a wonderful time doing this on Wednesday and Thursday, but it was kind of a disaster from Friday-Sunday. Booths selling food and drink at this event are spread from Hollywood Land to Paradise Pier, with most of them along the Performance Corridor in the center of the park, with the exception of LA Style, the Festival Showplace, and the Brewhouse near Monsters Inc. – Mike and Sully to the Rescue. 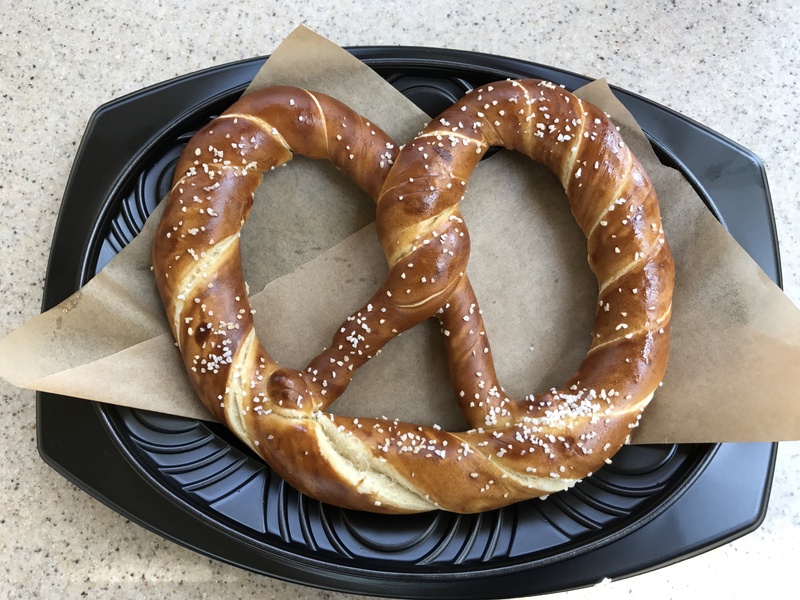 Jason Diffendal joined me on the trip out to the Disneyland Resort last week for a number of reasons, and the Food & Wine Festival was one of those reasons, so some off the thoughts you read below will also be his or include his point of view. This was one of our favorite dishes. The smoky flavor from the pistachios was amazing, and paired well with the ham and cheese. This is a must-purchase item. This was nothing special, but I wouldn’t call it bad. It seemed somewhat of a small portion size though, price considered. I know what you’re thinking about other festivals and how portions are never huge there, but there are some options at this event that can be quite filling. This was hands down the worst item at the festival. I imagine this is what expired chocolate milk tastes like, because that is the only flavor I could possibly attribute to it. The pudding was in “chunks” and settled to the bottom, so when you drank it through the straw it had the texture of drinking curdled milk. Believe it or not, it was one of the highlights of the 2017 lineup. The filling was sweet and creamy and the dark chocolate coating was perfection. I know it might sound peculiar, but this is a must-buy if you are going to the event. I am not a cider fan, but Jason was excited to try this, so these are his words: Ace is a fairly well-known cider both on the west coast and the east coast. Being an unfiltered cider, this was somewhat different in appearance but lack of filtration doesn’t really impact the taste. What did impact the taste, though, was the blood orange juice, which made this a very pleasant drink. As with the wines, the cost was higher than I would have expected for the portion size seemed to be the same as a wine pour even though this is cider. As you can see, this was a fairly sizable piece of beef for the price, and it was definitely tasty. If you are a pork belly fan, you’ll love this. The meat was very good, and the bao was fantastic, which we didn’t expect coming from a booth in the middle of California Adventure. This is a prime example of how the menus at this festival are a lot more adventurous than any festival at Epcot. This ice cream pop was great, and was one of the better desserts at the festival. You might think how could this be good, but the milky flavor accented by rosemary and avocado flavors makes a lot more sense once you try it. This was a great dish, and a good value as well. The shrimp was decently sized, and the crab claw was surprisingly large for a relatively small glass. Everything tasted fresh and overall it was quite refreshing. This was just OK. It was tasty, but in reality it’s just an expensive dinner roll. This was excellent. If you like panna cotta, get this – you won’t be disappointed. The cherry jus added a nice flavor. I’m still not sure why this is at the olive booth though. It seems like they needed a dessert for that booth so they added a few drops of EVOO and declared it eligible. We’re kind of glad they did. This booth, as you might imagine, was one from which we expected great things. Unfortunately, the bacon craze sweeping the country often leads to disappointment. Jason liked this; I didn’t care for it. I think wedge salads went out of style a few years ago. Jason gave the blue cheese dressing high marks. Probably one of the dishes we were most looking forward to, but it ended up being one of the most disappointing. The mac and cheese wasn’t creamy at all, and the bacon didn’t make up for it. The french fried onions were the highlight. If you get fresh, creamy mac and cheese it will probably be better. Another dish we were excited about that didn’t live up to our expectations. Neither the maple nor the bacon were very prominent flavors. It tasted like a Little Debbie snack that has sat in the wrapper for too long. The cardboard trays are a nice touch… can we get these at Epcot please? This was surprisingly tasty. The roasted cauliflower was good, but the star of this dish was the puree with sundried tomatoes and fried capers. A healthy dish, and a healthy portion size for $6.00. We thought this was very good, but a rather small portion size. Apparently “potato smash” is SoCal lingo for tater tots. This was a great version of a mule. The sweet lemon contrasted nicely with the ginger beer. This was basically an $11.75 version of the Gold Rush from Paddlefish, albeit much cheaper. I’m not even sure what Furikake dust is, but no matter. The salmon was fantastic, and the portion was generous for the price. If you like smoked trout, you can’t go wrong here. Well, I guess if you hate deviled eggs you can go wrong, but otherwise this was a mouthwatering combination of the two. The mac and cheese here was much better than at the bacon booth, and the french onion topping was spectacular. This would be in our Top 7 from the event (which we will have for you soon), and pretty high at that. This was fine, but I think too many people go crazy when they hear ‘Wagyu beef’. Realistically, if you are going to braise a piece of beef, it’s pretty much a waste to use anything expensive. The whole point of braising is to tenderize the meat. However, what made this dish great was the polenta. I guess this filled the requirement for Pop Tarts at the festival, although it was more like a chocolate croissant. Not terribly unique, but still quite tasty. A great summer drink without being too sweet. After having the tacos at Paradise Garden Grill (see below), we didn’t expect much from these. Also, looking at them, you might just think that they will taste like theme park nachos. You would be wrong. This was surely one of the top items at the event as the carnitas packed a great flavor and the nacho chips themselves were spectacular. Another dessert, and another home run. This only had a hint of corn taste which made it a scrumptious offering. The Pacific Wharf Cafe has always been my favorite counter service in the park, so the booth offering Boudin sourdough products has been the driving force for me to even visit the DCA Food and Wine Festival. It did not disappoint. You can’t go wrong with almost anything served in a baby bread bowl boule, and this salad didn’t disappoint. We got a whopping 7 (yeah, 7) shrimp, which made this possibly the best value at the festival. I’m not sure if there are guidelines for how many shrimp go into this dish (there likely are), but I’d think it had to be less than 7. Your mileage may vary. Again, how can you go wrong with cheese soup in a bread boule? This dish was probably worth the trip to Anaheim alone. 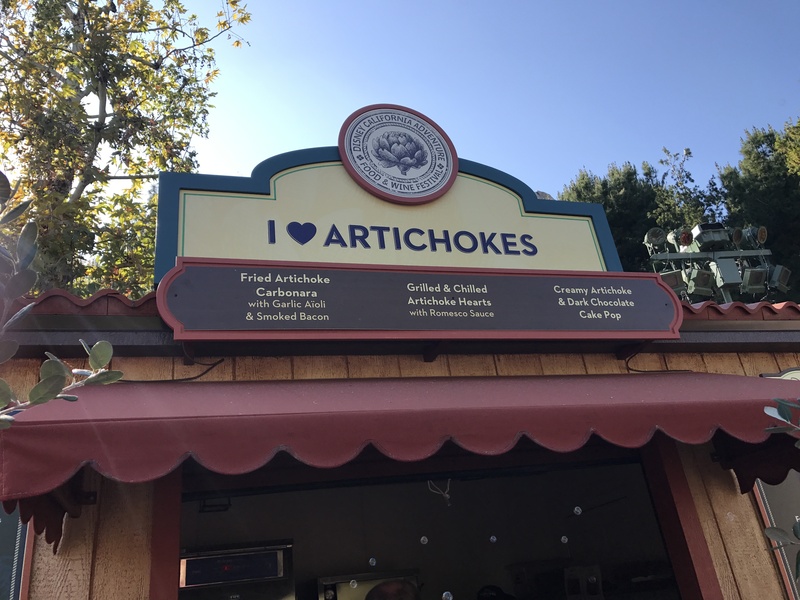 If you enjoy the broccoli and cheddar version at Pacific Wharf Cafe, you will LOVE this. A surprisingly good dessert, a perfect pairing of the chocolaty bread pudding and vanilla sauce. This was solid, with the jam was the highlight. Probably not the best value for $6.50. Another solid offering, but not something I would recommend or order again. It’s fairly standard. This was good, but not one of the best dessert options. I would skip this and hold out for the panna cotta from Olive Us. I’m not sure whether this is a beverage or a dessert; it’s basically a cross between them. Two scoops of ice cream in a full-size cup, with pineapple-strawberry juice and the requisite boba balls. This was excellent, and a great deal at $7.00 as it could be shared at this size (or not, if you don’t want to…). I couldn’t find my picture of it, but Jason had the Nom Nom Mango Hefeweizen. While it was a good beer, it lacked enough mango flavor to make it much more than a standard hefe. The Deschutes float was phenomenal, even if it may not be the prettiest thing to look at. If you like porters, get this. They give you the choice of vanilla or chocolate ice cream, and we’d highly recommend the chocolate. The only festival offering that takes over an existing counter service location is the Paradise Garden Grill & Beer Garden. It’s worth noting that the beer garden itself is a separate stand from the counter service location which has the food. The stand is located just to the right of the restaurant, in front of Goofy’s Sky School. The beer flight was interesting, and I say that because Jason and I have very different taste in beer. I did not care for the lighter beers but loved the two darker ales, but Jason went the other way. The flight is probably worth trying if you have never had any of these before and you enjoy at least trying something new. We loved this beer! It wasn’t too sour and had a pleasant mixed berry flavor. The beer is nice and light, a perfect summertime drink in our opinion. The meals here are full size, so you should plan to share them if you eat here and want to do a few booths in one day. While simply cod, this is probably one of the best counter-service fish entrees – it is very, very good for what it is. These are large, quality pieces of whitefish, and I really love the thick steak fries that accompany them. The slaw was vinegar-based, not creamy, and we didn’t care for it. The pierogis were a disappointment. The vegetarian sausage was pretty terrible (and yes, I’ve had vegetarian sausage before) and the pierogis were fairly bland, run of the mill ones like you can buy frozen in any supermarket. Not my favorite dish, but the pork tacos were enjoyable. I feel the California crowd will be a little harsher on tacos than I and will likely hate these though. They kind of tasted like something you would get from the Mexico booth at any Epcot Festival. The sausage trip was probably my second favorite meal here, next to the cod. I wish I could tell you what kind of sausage each of these was, but the menu did not indicate it and the cast member at the register did not know what they were. Regardless, all three were tasty and the warm potato salad was enjoyable as well. The mustard was a good German-style offering that paired well with the dish. It’s a pretzel. 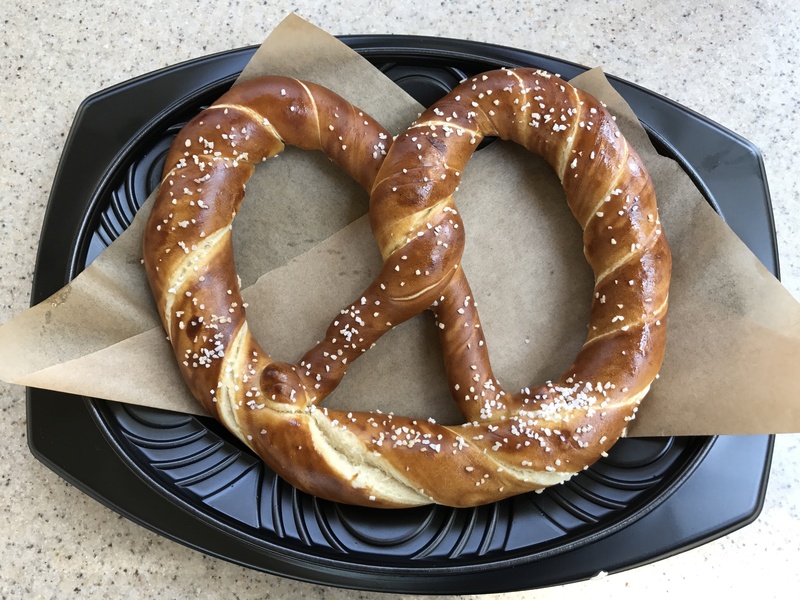 Don’t get me wrong, it’s a very good pretzel, not your typical theme-park offering, but nothing too unique either. The beer cheese dipping sauce is not the best I have had either, but enjoyable enough if this is something you are looking for. This was one of my favorite items in the entire festival. I like just about anything with a salted caramel flavor, and the blend with the chocolate crumbles and Chantilly cream is pretty much perfect. This didn’t sound like something I would enjoy, but it ended up being another favorite. The cake was nice and soft, filled with a sweet custard, accented nicely by the honey drizzle and almonds. If you aren’t a chocolate fan, this may be your favorite dessert from the entire festival. The 2017 Disney California Adventure Food and Wine Festival is absolutely wonderful. This was my first visit ever to the event (it returned last year after a several-year absence) and I was completely blown away. As someone who has reviewed the last 10 years of Epcot festivals, this by far had the best food and drinks lineup of any event I have ever been to. 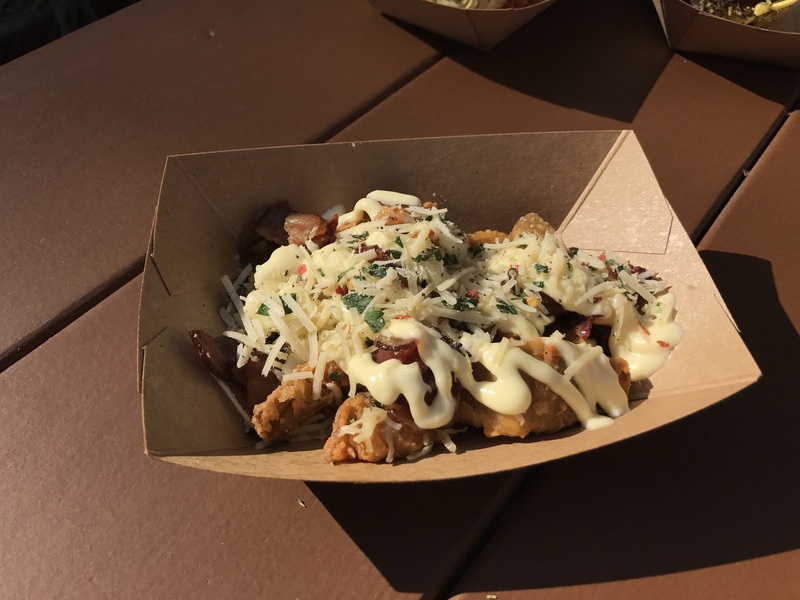 While I always find a few items that I absolutely love at the Epcot events, the success rate here was much higher, also offering up far more unique dishes and beverages. Considering that there are only ten food booths here, compared to Epcot, quality trumps quantity. 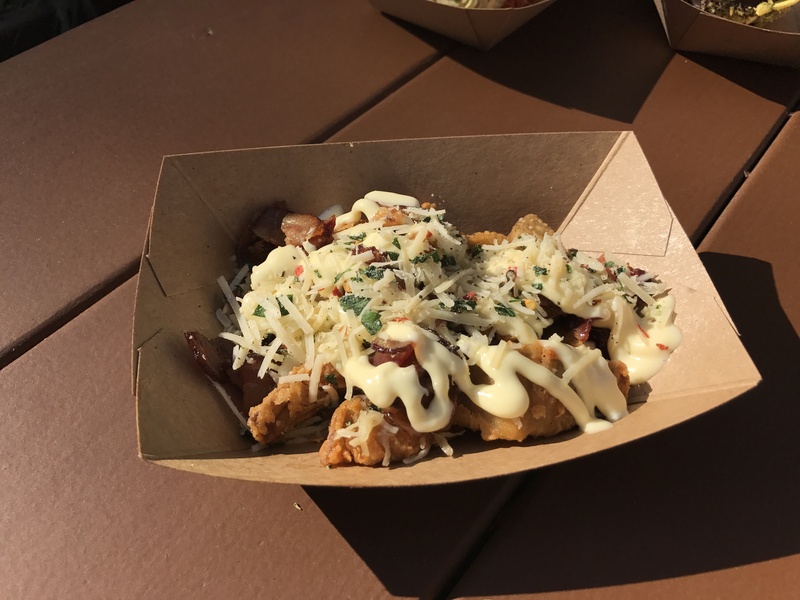 It’s hard to find a booth at an Epcot festival where all three dishes are winners, but most of the booths here had just that. I can not recommend this event enough. The 2017 Disney California Adventure Food and Wine Festival is a must-do at the Disneyland Resort! I will for sure be returning in 2018. I’ll leave you with one more tip: be sure to pick up the Sip and Savor Pass if you are an Annual Passholder at the Disneyland Resort. For just $45.00, you can get 8 take redeemable for any non-alcoholic items. This is a great value as the price per tab comes out to about $5.60 each and most items are $6.00 or more. Thanks for the photos of the food altogether. Makes all the difference. Who let you out of the bin early??? I have to agree with her, though sometimes, the truth hurts. WDW Florida has huge problems. Only theme park in town losing attendance and money. Sad they don’t see they cause it themselves….middle management only concerned about day to day and inch by inch profit. Yea, Epcot looks NOTHING like that…almost like different company…but WDW Orlando parks are PACKED, maybe Disney thinks, with this many idiots, why even TRY?? So, in other words, you burned a month of Patreon money for this smorgasbord. Don’t hate the player, hate the game, I guess.